Description: Metra Milwaukee District North Line train #2115 glides past milepost 39 en route to Fox Lake, Ill., on the last day of 2003. Description: Metra 105 passes Tower B-17 with Milwaukee District West Line train #2219 on a sunny Feb. 25, 2004. Description: Metra 105 leads Milwaukee District West Line train #2233 into the sunset at Wood Dale, Ill., on March 29, 2004. Description: The F40 heads to the suburbs, while the leading edge of an inbound heads to the buffers. The Chicago Transit Authority Green Line train passes over both and the river heading west. 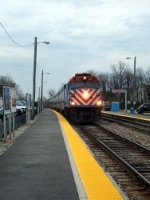 Description: Metra train leaving Libertyville station inbound to Chicago. This is the rear of the train. Title: Metra at CP Robbins. Description: First class mirror effect at Naperville Metra Station.